PepJet™ DNA In Vivo Tranfection Reagent is a novel cationic peptide based DNA delivery tool. This 28 amino-acids long peptide is accidentlly identified as a strong vector in delivering DNA in vivo. With help of protein alignment and simulation software, the peptide was synthesized, refined, screened and validated by simulating a virus protein. 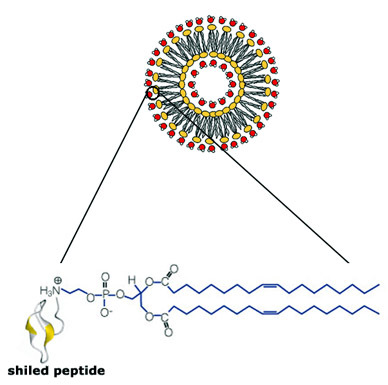 A shield peptide was also linked to the backbone to prevent In Vivo environment interferences, leading to high In Vivo transfection efficiency. PepJet™ was confirmed to give best renilla luciferase expression in lung, liver, spleen and kidney. 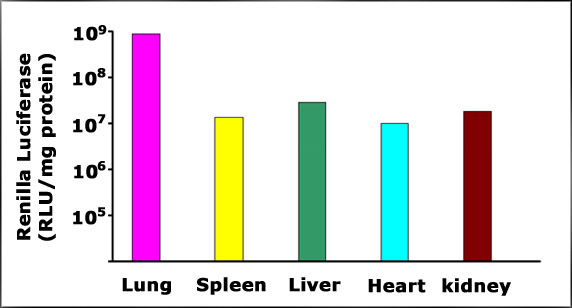 Comparison of the delivery efficiencies to different organs in mice of a plasmid containing the Renilla luciferase gene mediated by PepJet™ reagent.